It’s been a long time, but it’s finally here: the final night in London. It’s been quite a journey and my post tomorrow will reflect on the journey as a whole. For now, though, I want to focus on this final night. After all the packing was finally complete, we all flew between each other’s flats, saying our see-you-laters and enjoying one another’s company. We capped the night with a trip to the Exmouth Arms, my favorite pub. I got a few pints of my favorite local brew and we enjoyed great conversation and delicious food. 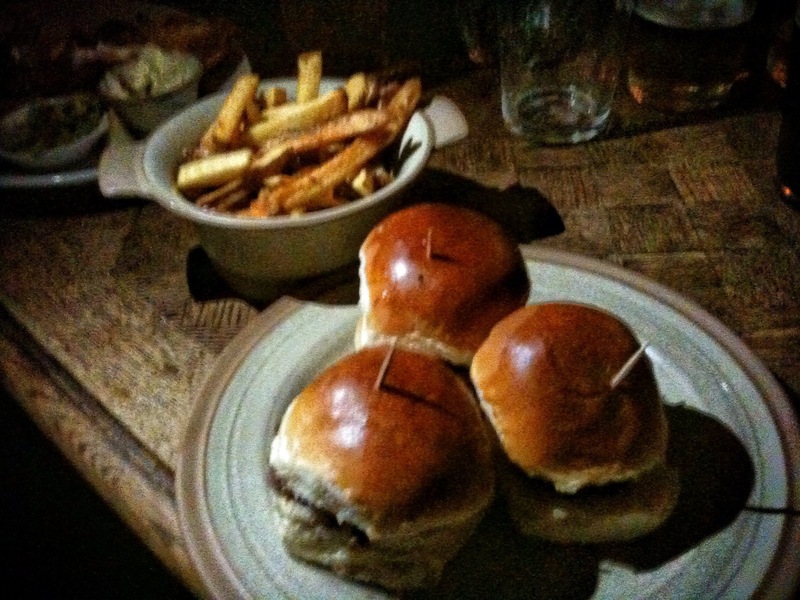 I decided to go full circle with this trip; thus, my first and last meal in London was Exmouth Arms’ sliders. They were perfect, and I decided to order a round of chips to accompany them today. I ended up deciding on the Exmouth Chicken Club, the sirloin burger with confit onions, and the classic lamb and feta burger. It was the perfect way to end this trip of a lifetime, surrounded by friends and food. All in all, a good day. I arrive home tomorrow. (FINALLY) London, it’s been wonderful.